It is important to me that my children spend time daily with God. Sometimes, though, that time is not as beneficial as it could be simply because they just don't know how to study their Bibles and pray. Ballerina has started to use the Spiritual Circle Journal for Kids & Teens from Spiritual Circle Journal as part of her daily Bible time. 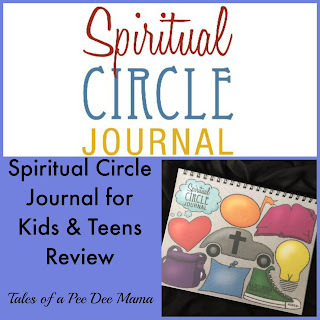 For this review, we received the Spiritual Circle Journal for Kids & Teens, a 94-page, spiral-bound journal. 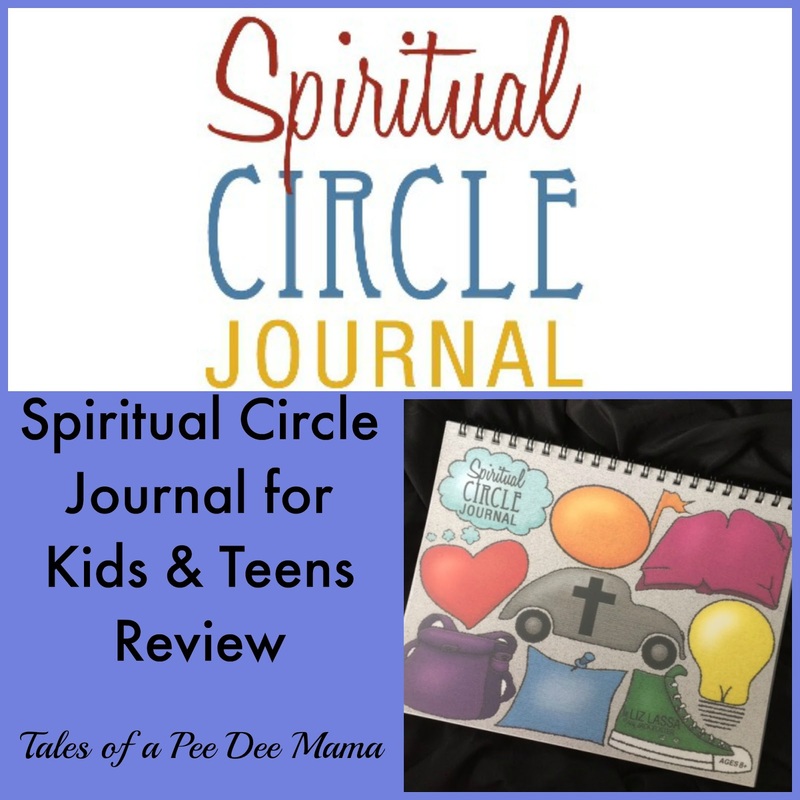 Three of the first few pages of the Spiritual Circle Journal for Kids & Teens include a guide for parents, teachers, homeschoolers, and ministry leaders explaining the concept and usage of the journal. I really appreciated this because then I could read through the guide and help explain the various aspects of how to use the journal to Ballerina before she got started. These pages encouraged me to share how God has led and guided me. They also gave some tips for how to make her time with God fun - providing a fun pencil pouch filled with pens, colored pencils, watercolor pencils, etc. ; encouraging drawing and art journaling; having her make collages with magazine pictures or scrapbook paper. The concept of keeping a journal isn't a new one, but keeping one to go along with daily time with God is a great idea for helping structure that time. It's really easy to sit down with a Bible, read a chapter or two, close it up, put it back on the shelf, and then wonder "What did I read?" The Spiritual Circle Journal for Kids & Teens helps to give that Bible reading time a focus so that Ballerina doesn't just remember what she's read, but she also can pull out theme, concept, Bible verse, etc. Each of the journal pages contain nine illustrations to fill in. These cartoon-like images make completing the journal page more interesting. The illustrations include a thought bubble, music note, open book, heart, car, light bulb, back pack, pinned note, and a sneaker. The front of the journal contains a key to describe what each picture represents. The thought bubble is a journal entry. The music note is a place to write down a song lyric or Bible verse. The open book is for recording important things learned during Bible reading, Sunday school lesson, or sermon. The heart is for confessing since it's important to have your heart right when you are in your time with the Lord. The car is to record where you've seen God moving in your life. The light bulb is for recording life lessons or "lightbulb moments" in your life. The back pack is to record prayer requests where you need God's help. The pinned notes is for thanking and praising God. The sneaker is for anything that God is asking you to do. I love that the images were so carefully chosen. Each one really symbolizes the aspect that Ballerina was to journal about there. At the end of the journal are Summary Pages as well as instructions for how to use them. These are spaces to go back through the journal and then record the most important things God has taught during the use of the journal, the verses that have meant a lot, God stories (I like this because it's always good to look back at how God has moved in our lives), and Bible characters' strengths and weaknesses. I really like the concept of the Spiritual Circle Journal. They also offer one for adults that is circles and not shapes for each page (hence the name "circle journal"). I think this would really help me focus during my own quiet time. Are you interested in what others have to say about Spiritual Circle Journal? Check out more reviews from the Schoolhouse Review Crew.